Even though I have a blog category called Super Foods, I don’t believe the astonishing claims of “super food” products (powders, pulps, supplements, etc.). The açaí trend is an example. There’s no science behind the claim that açaí powder can reverse diabetes, defeat cancer, help you lose weight, or increase boy-part prowess in older men. Those over-the-top claims have all been made, but there’s no evidence to back them up. Geez, like life isn’t tricky enough. Now we have to vet our food for false health claims. If it’s not açaí, it’s Tahitian noni juice, or Himalayan goji berries. Each one of these plants have “medicinal” health benefits, but they aren’t going to cure Alzheimer’s or stop the aging process. There are no magic potions. No silver bullets. Having said that, I’m a big believer in plant power to help resolve biological imbalances, rejuvenate our inner space, and boost overall health. Processed food, environmental toxins, stress, and poor lifestyle choices increase the risk of disease. The more we understand what’s going on inside (up close and personal, on a cellular level) and the more we focus on the foods that promote vitality and mental clarity, the better we feel. The more radiant we become. Who doesn’t want that? Did you read my last post? How much of you is really you? If not, check it out as that post, this one, and my next one will all be connected. Last week’s was about bacteria and the importance of keeping our inner bacterial garden healthy and balanced. This post will touch on foods that inhibit disease-causing bacteria and help the “knights in shining armor” keep the cooties in check. Okay, ready? Put on your geek hat. Quorum sensing is cell-to-cell texting between bacteria. It’s their version of using a “cell” phone (pun intended) to communicate. But rather than an expensive iPhone, they use chemical signaling molecules to pass information around and gather the troops to do good things or to wreak havoc. Bacteria have an amazing ability to engineer their environment and to impact human health. They’re innately smart, very communicative, and quite creative, so it’s important to have the good guys calling the shots. According to a study in the June 2009 issue of PLoS One, a peer reviewed science journal, the human gut is home to about 9 million unique bacterial genes and once we lose control of proper balance, the s**t hits the fan, so to speak. Probably the most famous example of quorum sensing is the bioluminescence of fireflies. Did you play with fireflies when you were little? I did, although I had no idea how they turned their little tail lights off and on. Fireflies individually regulate their light, but they receive feedback from the other light flashes around them. Peer pressure encourages them to flash in unison. Photinus pyralis is the firefly bacteria that produces light via chemical signaling (quorum sensing). How cool is that? They definitely glow from the inside out and they do it as a community. That’s quorum sensing and it’s also how super bugs join forces and discuss how to outsmart antibiotics. It’s how your inner garden becomes overrun by weeds. We don’t want that. Smart plant guys and gals have discovered that vegetables like broccoli, Brussels sprouts, cauliflower, horseradish, garlic, and cabbage (among others) inhibit the growth of disease-causing bacteria. Pseudomonas aeruginosa, to be exact. MRSA (nasty staph germ) and pseudomonas aeruginosa are smart little critters. They’re becoming antibiotic resistant, which is not good. Here’s the deal, though. If we eat right, avoid the over-use of antibiotics, and focus on health-promoting plant foods, we’ll at least be tending our internal garden in a positive way. We’re setting ourselves up to have an army of good bacteria working (quorum sensing) on our behalf. Go, good bacteria, go! So, skip the expensive and exotic “super food” powders, supplements, and elixirs and go eat some broccoli. Plants can be potent therapeutic agents, but you don’t have to go to some far-off rain forest or spend a fortune to boost your internal fire power. Ride your bike down to the local farmer’s market and get yourself some green quorum sensing inhibitors. Peace, love, and plant power. PS Stay tuned for a simple test to see how well you know yourself. This entry was posted on Monday, October 15th, 2012 at 7:06 am	and is filed under Artful Aging, Miscellaneous, Nutrition Therapy, Super Foods. You can follow any responses to this entry through the RSS 2.0 feed. You can leave a response, or trackback from your own site. Keep it simple baby, I like it. I’m never buying that expensive acai powder again How cool is it that our cells text each other! Haha, great analogy. I heart you. Yes! Yes! 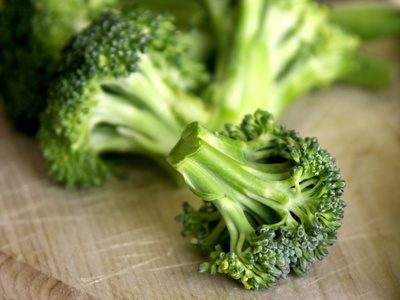 Locally grown organic broccoli provides infinitely more benefits than exotic super foods. Love this post….and all of the neat functions of our bacteria. Do you believe that our bodies do have “true” cravings if we really listen? Your post just spurred this thought. I’m a big fan of “old-fashioned” superfoods! I’d much rather eat my healthy broccoli (and the like) than wander the aisles of a “health food” store to pick up super foods via powders, etc. Most such stores have little in the way of real food on their shelves. Another great post, Melissa! I like your web site. Very interesting subjects. I sometimes use worm casting and tea on my plants. I also have a coi pond and would like to get more information on raising vegetables with pond water. I love broccoli putting it into a pot of water and bringing it to a boil turn the heat off cover and let set several minutes. Late to the broccoli–and all veggie-loving party, but wanted to say–thanks for telling it like it is. Too much emphasis on “super foods”, powders, supplements…not enough on eating real FOOD. I took literally hundreds of supps when I was very ill (before DX). They did Nothing, Nada, Zip except empty my wallet. Why? If you aren’t absorbing food nutrients because your gut is impaired, you aren’t absorbing supplements either.